The Trusted IdP feature in OneLogin enables you to configure multiple identity providers (trusted IdPs) that can sign users securely into OneLogin. This allows several identity providers to sign users securely into shared applications like Salesforce and Google Apps even though those applications support only one identity provider. The users do not have to have OneLogin accounts and do not require individual OneLogin licenses. With either of these scenarios, you also have the option to encrypt the SAML assertions returned with the response from the Trusted IdP. When a trusted IdP signs users into OneLogin, those users get a regular session as if they had authenticated using any other authentication method in OneLogin. The users must exist in OneLogin prior to logging in using SAML. Go to Settings > Trusted IdPs. Click the New Trust button. Issuer URL or issuer name for the third-party identity provider. IdP Login URL (optional) that applies if you are using the trusted IdP as your actual identity provider and using OneLogin only as a proxy. Enter the URL for the IdP's sign-in page and select More Actions > Set as Default IdP. Your users will be sent to the IdP's sign-in page whenever they launch an app from OneLogin and aren't already logged into the IdP. Email Domains (optional) if you want to use this trusted IdP provider for specific domains. Sign users into OneLogin: enable this option. The public x.509 certificate of the trusted IdP provider. User Attribute Mapping: assign the trusted IdP user attribute that will be used to populate the User field value in OneLogin. By default, this is Email. Enable encrypted assertions (optional): select this option and assign a OneLogin X.509 certificate if the trusted IdP requires that SAML assertions and attributes are encrypted. For more information, see Encrypting SAML assertions in responses from the Trusted IdP. The fields in which you enter this value differ by IdP provider. Consult the documentation for your IdP for guidance. For ADFS, you enter this value on the Configure URL and Configure Identifiers pages of the Add Relying Party Trust wizard, and the Endpoints tab on the Properties dialog for the relying party trust. For more information, see OneLogin Trusted IdP with ADFS. This feature is sometimes called SAML chaining. It is useful if you want to enable multiple organizations or departments not managed by you to have access to SAML applications connected to your OneLogin account, since most SAML-capable applications support only one SAML IdP per tenant. In this scenario, OneLogin acts as a SAML proxy and builds a new SAML assertion based on the data in the assertion from the trusted IdP, but with the correct recipient, audience, and signature. 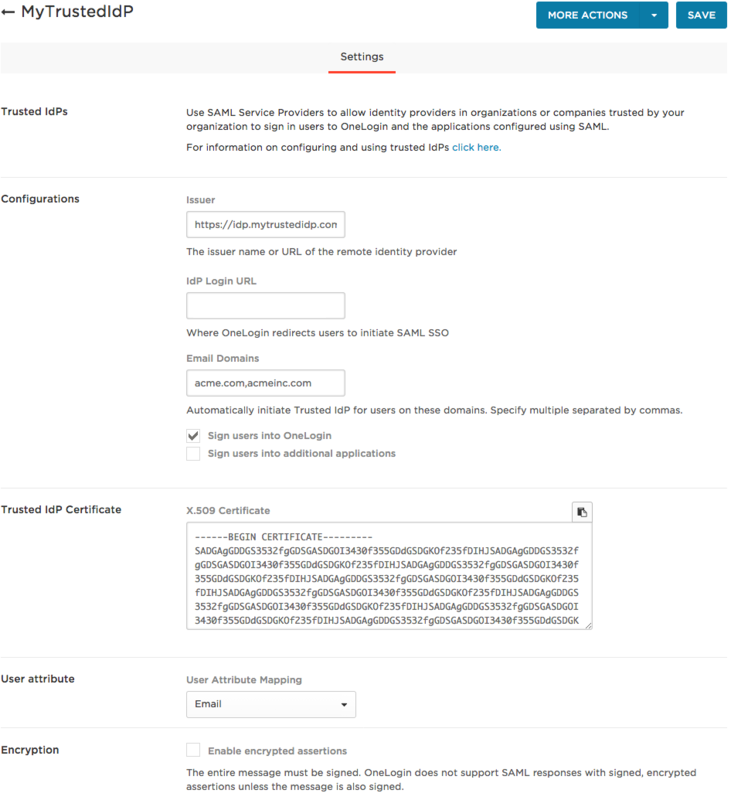 The SAML assertion will include the NameID and AttributeStatement structures from the original assertion, but with attribute values derived from those defined in the OneLogin SAML connector. Note. Because attribute values provided by the OneLogin connector have precedence over those included in the IdP SAML response, attributes defined in the OneLogin connector should not be blank. On the Apps page, select the app you want users to access using the trusted IdP. Click the app row to open a dialog where you can view and copy the SAML Sign-on URL. Cancel out of the dialog and click Save on the Apps or Settings tab. Go to the administrative interface for the trusted IdP (such as ADFS) and provide the IdP with the application's SAML Sign-on URL that you copied in step 5. Your third-party IdP may require that SAML assertions or attributes in the SAML response be encrypted. OneLogin supports encrypted SAML assertions, whether signed or not, but only when the entire SAML response message is signed. To enable encrypted assertions, you provide a public OneLogin X.509 certificate when you configure your Trusted IdP in OneLogin. That certificate will be used to encrypt SAML assertions sent by your third-party IdP to OneLogin. OneLogin will detect the encryption and decrypt the assertion automatically. Select the Enable encrypted assertions option when you configure your Trusted IdP in OneLogin. The X.509 Certificate field appears after you select the option. Select a OneLogin X.509 certificate. We recommend that you create a new certificate for each Trusted IdP that requires encrypted SAML assertions. You can click the Generate a new certificate link to go to the Certificates page and create a new certificate, but you should save your changes on the Trusted IdP edit page first. You'll leave this page when you click the link and will have to navigate back to it to complete your Trusted IdP setup.